4.1 Given a scenario, troubleshoot PC operating system problems with appropriate tools. Welcome to Exam Notes by CertBlaster! Well you have made it to CompTIA Main Domain 4 and you are well on your way to finishing up the list of A+ 220-902 objectives. Sub-objective 4.1 covers problems with a PC operating system, the symptoms that will present themselves and the tools you have to identify and fix any problems you encounter. This sub-objective is so large that we are presenting it as a Part 1 and Part 2. In this Part 1 we are covering all the items that fall under “Common Systems” and in Part 2 we will cover all the items under “Tools”. Here we go! Your system can crash anytime it encounters an unexpected condition or fails to receive its next instruction. Many situations see the user successfully shut down the machine and the next time they try to power it up they get an error. Interestingly there are two conditions that identify whether you have a hardware or software problem. If the system boots to a black screen it is highly likely that you have a hardware error. The message will be a little vague but usually points you in the right direction. BSOD on on the other hand indicates that the operating system is trying to load and has encountered an irrecoverable error. The BSOD provides the error code in hexadecimal which renders it unintelligible to human, but researching that code can reveal a better explanation of the error along with the conditions that created it. The Blue screen presents when an operating system in unable to complete its instruction. This could be due to a missing or corrupt file or malfunctioning hardware. In all cases when you see a Blue screen error it was generated by Windows. It will have a brief explanation and a hexadecimal error code. Research these codes in the order they present to recognize the chain of events that led to the error. When a Windows system is going to crash or the running application is going to crash you will experience a period of unresponsiveness usually indicated by a circular rotating icon designed to give you hope. This will in many cases be followed by a BSOD. The reason the Blue screen is considered proprietary is that only Windows systems generate this error. It is fatal to the session you are in and you will need to reboot. The system dumps its current state into a memory Dump (.dmp) file for use in troubleshooting. When a system fails to boot it is important to observe all of the conditions and messages that are provided by the system. These will present during post as Invalid System Disk or Disk Boot Failure or No boot device found. All of these messages indicate to you that the error is occurring before the OS loads. Some of the things that would cause this are UEFI/BIOS misconfigurations. For example if you have inserted a USB Thumb Drive, the system may be configured to treat the USB drive or even the CD-ROM as the primary boot device and subsequently fail. When presented with this condition, reduce the attached hardware to a minimum and clear the optical drives. A system malfunction can cause Windows to abruptly shut the system down to protect components. If you suspect overheating wait a few minutes to allow the system to cool. Then on restart investigate the issue with Event viewer to find clues related to the shutdown. Make sure your software is up to date and use the built in memory and hard disk diagnostics. You may find a system that will continuously loop rebooting to a BSOD. This can be attributed to an advanced startup setting that causes the system to automatically restart in the event of a problem. This can be reset in the Recovery Console > Advanced Tools window. Disabling the automatic restart provides an opportunity to access the system logs and determine the problem. Here is a hardware problem. Or is it software? Both answers could be equally correct depending on the error. If the device is not detected it is probably a hardware issue. Has new hardware been added? Interestingly while doing a Wi-Fi interface upgrade the system saw the new card and stopped the BIOS process. It would not continue until the card was removed! On another system this new card was installed but the device drivers assigned were incorrect and did not load, making it a software problem. Dynamic Link Libraries have been around since the first version of Windows, they serve executable files in their operation. In order to do this the dll file must be registered to validate its relationship to the executable program file. It is not unusual for multiple programs to use the same.dll. The relationship between the executable and the .dll is first established during installation where the File and the dll are linked. The pairing is also recorded in the component registry (COM+) or the older Regserv32 utility. When you have a service that fails to start the first stage of your investigation will be easy enough to examine. Use Administrative Tools in Control Panel and open the Services component. There every system service is listed along with its condition. Services can be set for automatic start, or the automatic start can be delayed to have less of an impact on system boot times. They can be started automatically or manually. 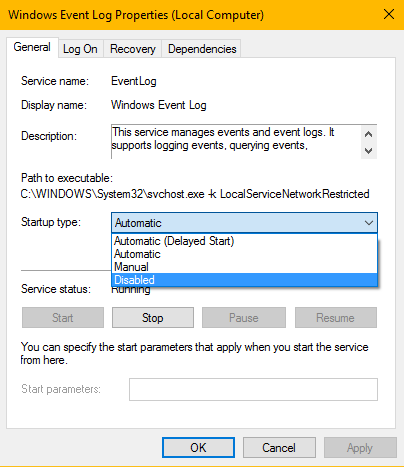 Here is a look at the Event Log Service Showing its current status and startup options. When you have a program that does not work find out if it has ever worked. If not this is in all likelihood a compatibility issue with your software. Try running the program in Compatibility mode by selecting an older version of your Operating System. In this case we have an audio editing utility that will not run properly. The image depicts the Audacity program’s property sheet showing the compatibility tab options. 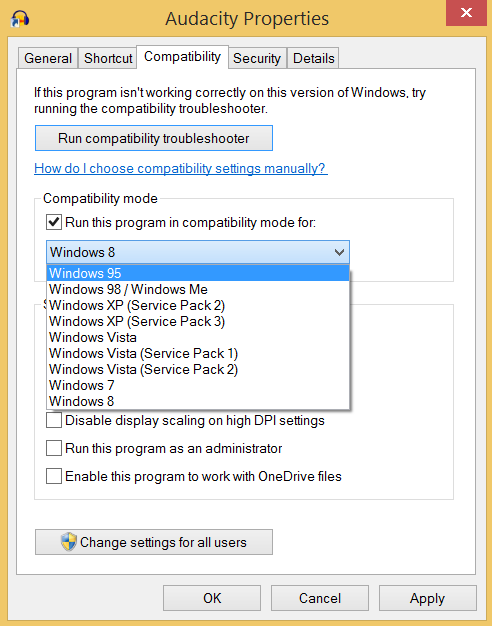 This allows you to “Run compatibility troubleshooter” which can identify program compatibility issues. Other options include the available operating system choices. Trial and error here will allow you to select the most recent OS for this program, however it is important that you check for updates to the program if you have identified it as outdated. Chances are that you have not gone a day without hearing a complaint from someone, a coworker friend and frequently from a cashier. No one is completely satisfied with their system’s performance. To separate their impression of performance from the capabilities of their system you have the tools to establish if there is a problem or that the situation is normal operation. Check the Background processes for scheduled tasks that may be hampering performance. A good example would be a scheduled malware scan that is in progress. This operation will impact CPU and Disk usage dramatically. Only on a system that you are authorized to make changes to, perform routine maintenance like disk cleanup and defrag including uninstalling unused programs. Then perform a clean boot to be sure you have a reliable start point. Or benchmark. 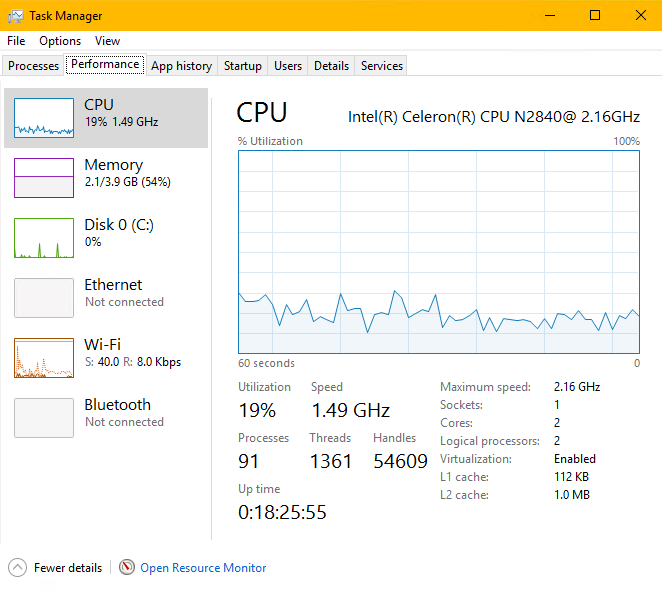 Now open Task Manager and check the Performance tab. Assess the CPU, Memory and Disk values for signs of problems. The image shown indicates normal usage. If you see incidence of higher than normal utilization of any of these key areas, check the Startup tab to see if there are any programs that are not frequently used and are consuming resources. Disable those programs after you have investigated their function. Do not disable anything based on your impression. Check the exact filename, research it and then make your determination. Reboot and evaluate system operation anytime you make changes of this nature. Then if satisfied perform the same evaluation using the Processes tab. Here on the Processes tab the running apps appear normal while the Background processes may represent a reasonable amount of memory that could be freed. Remember to fully investigate the application beforehand. 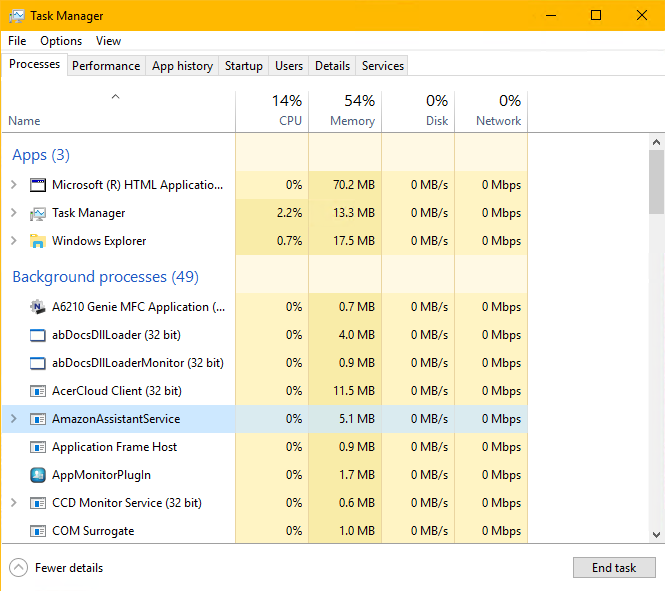 As an example ending the Amazon Assistant app eliminated the Microsoft HTML Application freeing up over 70MB of memory. A missing or corrupt registry entry or other startup file such as a Dynamic link library (.dll) file. A bad dll file will generally display a notification after boot. A bad device driver shown with an exclamation point. The bad device driver may not always notify you promptly. 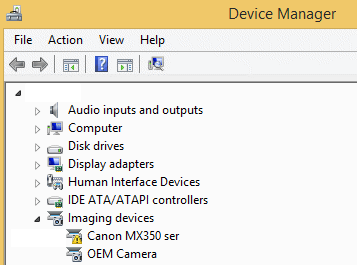 If it does not you can view the offending device in device manager using the Control Panel link or by searching for or entering devmgmt.msc in the Run box. Here we see a bad Camera configuration indicated with a yellow exclamation point. A setting in the System Configuration utility. 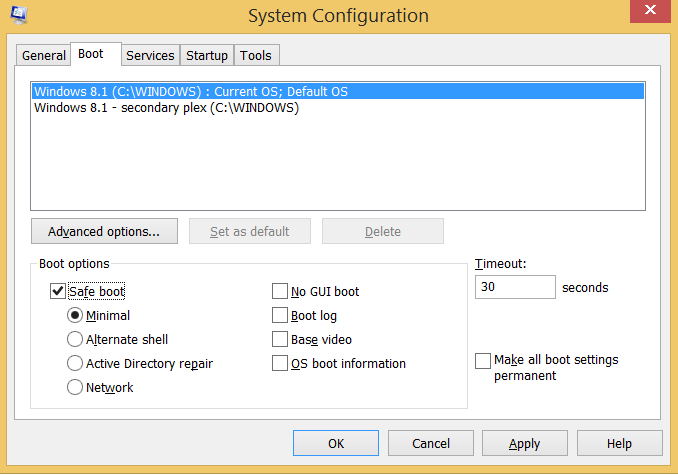 The System Configuration utility can be most easily by entering msconfig in the search or run boxes. This tool is extremely useful when trying to isolate a particular startup item. Open the System Configuration utility and choose the Boot tab there you will see your operating system choices along with your safe boot options. This hidden (from most) capability allows you to temporarily boot the system to various specific configurations to test the behavior. By all means do not make these changes permanent! Identify and resolve the problem, then uncheck the Safe boot option. To help you quickly access your content the file extensions are added to the file name like .doc or .pdf. These extensions are hidden from the user by default. The file extension is associated with the application chosen to open it. The observable result is a change in the appearance of the file’s icon to the program that opens it. Behind the scenes these associations are handled without incident. In the exhibit below the file extension was mislabeled and the operating system does not know how to handle the new extension. When it is accessed there is no default program and the OS offers alternatives. NTLDR (NT loader) is a boot loader program found in the boot sector and used to launch legacy NT based systems used in legacy (XP and earlier) Windows installations. You may also find it in dual boot systems that boot to older NT versions like XP or Windows 2003. The file along with NTDETECT.com and boot.ini are required for legacy boots. If you encounter a NTLDR error on boot the system will halt. This would be a case where you would boot to the installation media and repair the current version of the file BCD. Attempt to access either the Recovery Console or Recovery Environment and follow the steps to replace or repair NTLDR. If you are using Windows 7 or later the file may be an unneeded remnant from an upgrade. The file may be referenced in the boot.ini file which would support legacy and dual boot configurations. Choosing the Repair option in the Recovery console. As referenced earlier the boot.ini file contains the parameters to boot to legacy operating systems. If the file is missing in these environments the OS will use the default configuration. You will need to determine the need for this file based on the operating systems in use. In current versions of the operating systems, Vista and later the BCD loads after POST and handles system configuration parameters. The steps for repairing a “Missing Boot.ini” are the same as those listed above in “Missing NTLDR”. The problems with the files in that example indicate an NT based OS so you may want to recommend an upgrade. Microsoft no longer supports these legacy systems so patches and updates are not available. On a Windows 7 or later system the missing operating system error often results from UEFI/BIOS being configured to boot from the optical drive or USB device that does not contain a bootable media type like an audio CD, a multimedia DVD or USB drive containing ordinary files. This is the simplest condition in terms of a repair. Simply configure the boot order properly. If your UEFI/BIOS is configured to boot to the hard disk this could be a sign that the disk is failing or has failed. Confirm first that you are attempting to boot to the correct drive. Reduce the machine’s configuration to the minimum requirement, remove any external media sources such as thumb drives and optical disks. If there are more than one possible disk drives present make sure that you are booting from the correct one. If this fails your hard disk may be failing or failed. Start by attempting to repair the system by booting to your installation media and following the GUI prompts. 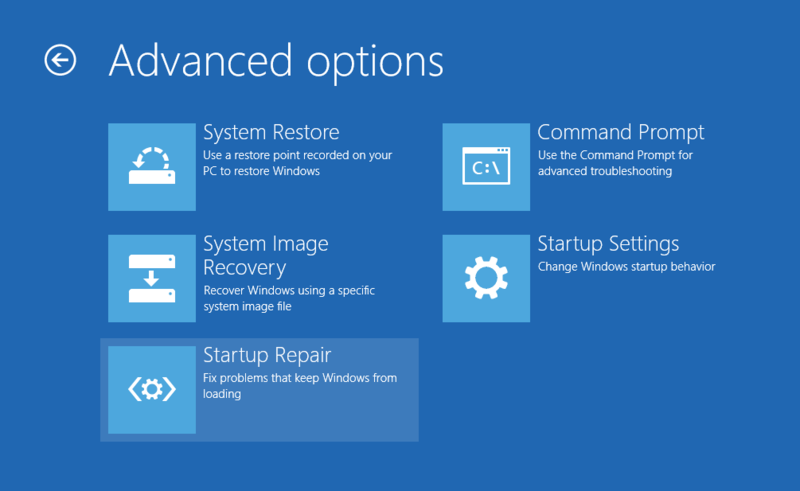 Access the Advanced options and choose startup repair. Use the options that are the least drastic until you have success. Do not reinstall your operating system. Aside from these options consider that this type of error does not occur accidentally this is a sign that your MBR has been corrupted. When you can access the system immediately backup all of your important data. After securing your data run disk maintenance utilities chkdsk and sfc. Consider a hard drive replacement. 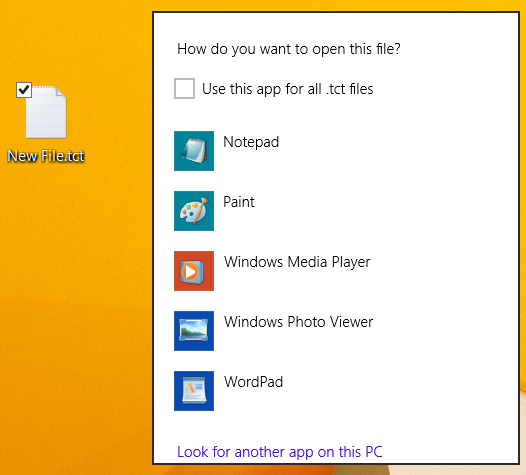 Here is a look at the Advanced options in Windows 8.1. When this condition occurs it can be most often be attributed to a hardware issue with your graphics adapter or subsystem. It could also be caused by the Windows kernel failing to load. In either case you will want to start by booting to your installation media and attempting a Startup repair. In the case of a laptop or other portable you can attach an external monitor. If it is graphics hardware this option is always worth a try. Linux systems use the GRUB bootloader or the older LILO bootloader. If you are unable to access the GRUB/LILO booting normally you can use one of the available Linux Live distributions. These Live operating systems operate exclusively from memory without making any changes to the existing file structure and settings. Once you have successfully gained access to the Live system you can use it to make any adjustments to your installation. This problem is most prevalent in dual/multiboot installations where, for example, a Windows installation overwrites the Linux MBR. Kernel panics occur in all operating systems. They are caused by a condition that the operating system considers unsafe and restarts to protect the system. In Windows you get the dreaded BSOD or Stop error. The BSOD dumps the contents of memory into a dump file (dmp) and reboots. Windows will reboot continuously by default until you intervene. In the Linux environment there are two types of kernel panic the lesser of these, an “oops”, is not a full panic and only kills the offending process allowing the system to continue to operate in a less than 100% reliable state. If there are multiple oops’s or even one severe one you will see a full screen of code as shown below. 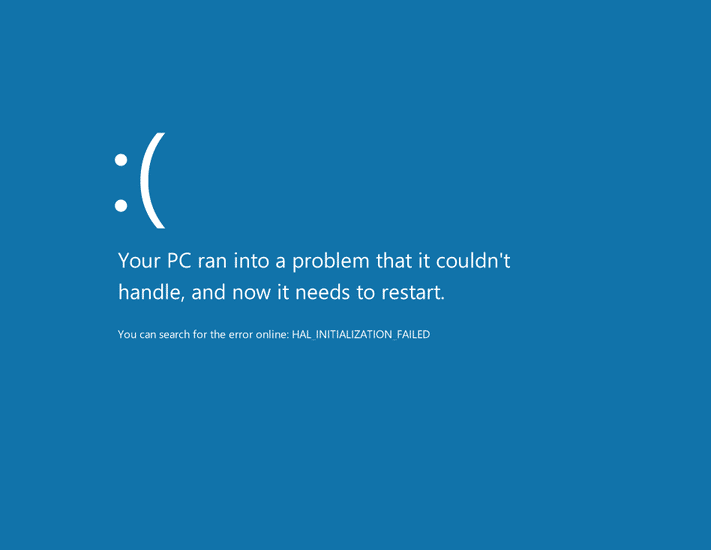 In Windows 8.1 you get the Blue screen of Death! This display can contain the offending memory address(es) and the dump details. But the useful information to you is Not Happy and Restart. Also note the description The Hardware Abstraction Layer has failed to initialize. Under the same circumstances the Mac OS X will restart five times and then shutdown the computer. The result of these errors is always a restart but to be unquestionably sure shut down the machine and restart to ensure that the previous session is completely clear. The same general information referenced in Missing Graphical Interface above is relevant here. Additionally here if you can reach the user logon screen you can test a different user account to determine if the issue is related to user display preferences and make the necessary adjustments. Even in the advent of very large monitors you will find instances where a single monitor is insufficient. This could be a laptop connected to a presentation device or simply a user who requires a slightly different configuration. On a Windows system there are a few ways to configure additional monitors. 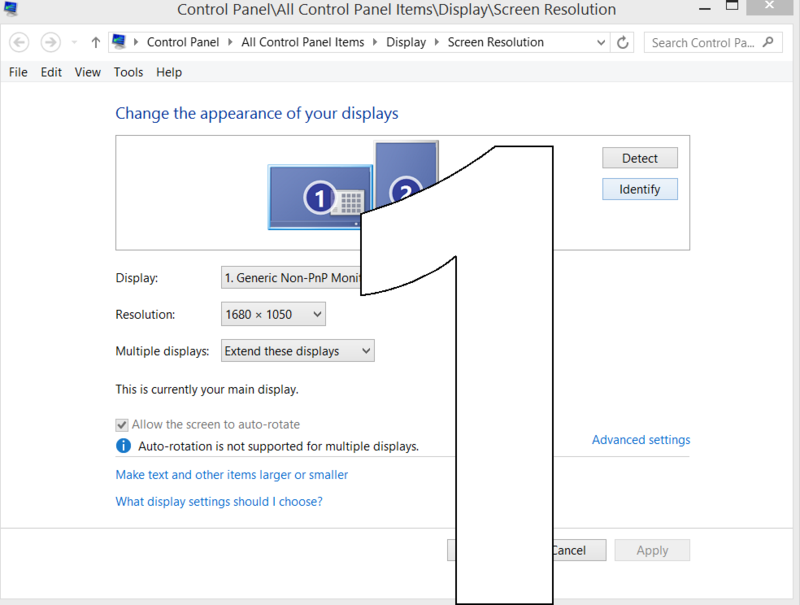 You can extend your desktop in the desired direction allowing you to configure multiple monitors to display a portion of the overall image. This makes it possible to drag items from one display to another. You can duplicate the monitors to allow a presenter to view exactly what the audience sees. Lastly you can adjust the output to display on one screen or the other while blacking out the alternate display. To do this first detect the displays which will show the monitor number to be sure of their initial orientation. Now either monitor can be positioned and oriented as desired. Often it will be necessary to change the default text size to enhance readability. Also in a case where the coloring needs to be perfect you can use the Advanced settings to manipulate the coloring to match across the displays. Here is a case where the main display is in landscape mode while the second display is in Portrait mode to allow for editing lengthy documents. Well that’s all for A+ exam sub-objective 4.1 Part 1! Part 2 will be here in just a few days. Missing Boot.ini – There’s no explanation on how to actually fix this error. Thanks for pointing this out. We just updated the page and the change is live now. The answer is that you handle a missing boot.ini the same way as the steps listed in “Missing NTLDR”.